Hi, Using the following code (and adjusting the variables to test the different scenarios), I need to build on the existing WHERE clause, to incorporate a CASE statement.... from t1, t2 where case t2.compare_type when 'a' then t1.some_type like 'nothing%' else t1.some_type not like 'nothing%' end I know that my WHERE is clause is not correct. Any help would be great in knowing if this type of statement is possible. Or in PL/SQL you could probably define the table name in a variable and then in the from statement reference the table name variable. -----Original Message----- I'm pretty sure you can't use the case in the from statement. In this article we discuss using a subquery in the FROM clause. Other articles discuss their uses in other clauses. Other articles discuss their uses in other clauses. 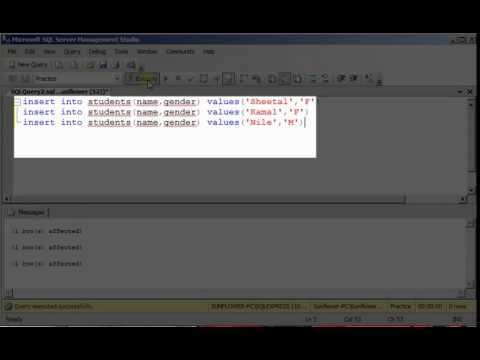 All the examples for this lesson are based on Microsoft SQL Server Management Studio and the AdventureWorks2012 database. This SQL Server WHERE clause example uses the WHERE clause to define multiple conditions, but instead of using the AND condition, it uses the OR condition. In this case, this SELECT statement would return all employee_id , last_name , and first_name values from the employees table where the last_name is 'Johnson' or the first_name is 'Danielle'.